“SMALL CRAFT ADVISORY,” the local radio weather said. No surprise, I thought, as I pulled into the motel parking lot. Rain was slashing sideways in a steady gale beneath the streetlights, and I got soaked running to the office to check in. I was really hoping we wouldn’t have to cancel tomorrow’s trip. Dave was driving up all the way from lower Michigan just for this, and I had a brand new rod to try out, the Orvis Helios 3D 8-weight. This late October trip was going to be my last chance until spring thaw. A little later, I got a text from Luke, our captain for the next day, with a screenshot of the marine forecast: gale warning—winds from the northeast at 20-30 knots—swells at 10-15 feet. “Get ready to live,” he said. By morning, the rain had quit, and wind had shifted to the northwest, putting our marina in the lee of the gale. It was still cold, and the sky was still dark, but it was game on. By 8:30 Dave and I were white-knuckling onto the grab handles of Luke’s 20-foot Ranger as we ran across the bay and into the Apostle Islands. It took me a few minutes to realize why I felt so uneasy—it was the unsettling sensation of going uphill and downhill a boat. Water’s supposed to be level. But last night’s swells were still rolling, wind or no. That nor’easter had stuffed Chequamegon Bay and the Apostles full of gale-force energy, and it was still reverbing between the sandstone cliff faces. Luke idled us up to one of these cliffs. Here, the swells were smaller but more staccato, slapping and sloshing against the rock, filling and draining small hollows and sea-caves with weird deep sounds that we could feel through the hull of the boat. The bow rose and fell irregularly. Neither Dave nor I stood up right away. “You guys going to fish, or what?” Luke asked with a grin. Dave went to the safer-looking stern and pulled out a ziploc bag containing the two flies he’d tied for the trip, both hot pink, lead-headed articulated jobs. Dave names his flies. These were Edmund and Fitzgerald, he said. A little gallows humor to stoke our courage. I tied a pink Murdich Minnow to the end of a four-foot fluorocarbon leader, and I stripped from the reel most of a Scientific Anglers Sonar Titan in full intermediate, 8-weight, which has a 240 grain head weight. I set my jaw and stepped onto the bow. As it turned out, on their own, my knees became serviceable automatic shock absorbers. The trick to developing sea-legs—not falling out of the boat—was to quit trying so hard. Which of course is also the trick to good fly casting, especially with a new rod. The first couple casts with the H3D were ranging shots, sure, but between the bucking boat, the sonorous and picturesque Apostle cliffs, and the luminescent swimming fly, I didn’t have a lot of attention left for the act of casting. I was just fishing. Maybe the trend toward ultra-fast laser-cannon rods is slowing, or maybe the graphite tech is just getting better. Probably some of both. Either way, the H3D (“D” for “Distance,” versus the “F”-for-Feel model) does not deliver that “you’re not a good enough caster yet” message that I’ve often experienced with new high-end rods. For example, the 8-weight Helios 2; when I first picked one up, just I couldn’t get the timing down. Eventually though, casting a 300-grain sink tip felt like what I imagine launching a spear from an atlatl feels like. Not so with the H3D. I was fishing right away. It casts a short line well, but still has plenty of power, which it applies appropriately as you increase line length. It’s not the lightest rod on the market—the H3D is in fact heavier than both the original Helios and the H2—but it’s not a problem. In fact, the extra weight reminds me to not muscle the rod. It gets out of your way, if you get out of its way. When the first ads for the H3D were released last year, they featured a short, stylized video of an angler casting the rod and looking up at the rod tip on her backcast. Orvis got some social media blowback for that—armchair experts critiquing the caster’s form and technique. But I’ll tell you what: when you cast an H3D for the first time, you’ll look up at the rod tip. Because on the abrupt stop that you make at the end of each casting stroke, the rod tip stops. Dead stop. No oscillation or vibration. The line unrolls from the tip in a straight line, without the normal sine curves traveling down toward your fly. It feels weird at first. 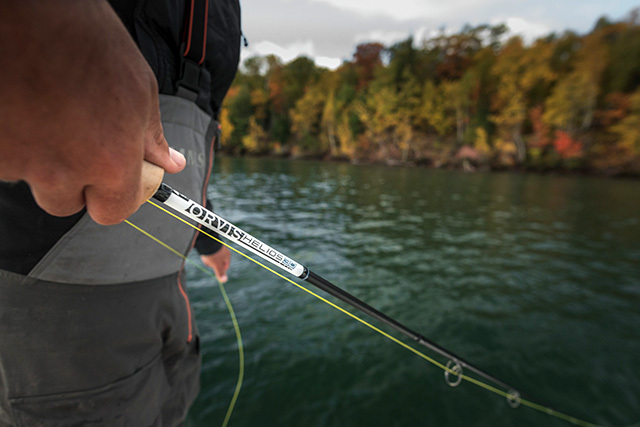 Orvis claims the H3D is the most accurate fly rod ever made, due to new developments in materials and graphite lay-up. I’ve not cast enough 8-weights, nor am I a good enough caster to agree or not. But it definitely made hitting targets feel more natural and less random. If I missed, without the rod tip bouncing around and confusing things, it was more clear that it was my own error. The type of fishing that day—Lake Superior inshore brown trout streamer fishing—was not about the importance of casting accuracy. But there’s still a cathartic pleasure in hitting your spots: that crack in the cliff face, just behind that surface-lapping boulder a foot off the wall, between those old logging crib pilings. When you’ve been fishing all morning without seeing a fish, that kind of fun is what keeps you grinding. So we ground our way along a rocky flat. Fifteen feet down the stones ranged in size from football to Frigidaire, and no fish were visible. I was trying to explain to Dave and Luke how a rod can feel alive and dead at the same time and then there was a fish. Out of an acre of empty water a giant bronze fish was suddenly sharking an inch behind my pink Murdich. I stripped faster and faster, the fish turning away only to dart back onto the fly, first right and then left, and then I was out of line and the fly was at rod tip. The trout bolted off into the rocks somewhere. For an instant he was fully real, three feet of black-spotted bright gold glowing in the blue-green water of the lake. As the afternoon wore on I had a few more follows like this—none from fish as large—and landed a few small coho salmon. Dave caught several of those as well, and one nice brown, about 26 inches. He was fishing a full-sinking line, and it seemed the fish were more willing to commit deep down. But I couldn’t give up the visuals of the chase, so it wasn’t until the end of the day that I strung up the 300gr SA Sonar Sink Cold 25, my go-to deep line. As expected, this shooting head wasn’t as elegant to throw as the more traditional line, but the H3D handled it just fine, with power to spare. I wouldn’t be afraid to put a 350 on it to throw large pike flies. We were packing up our gear at the boat launch later when I finally gave the rod a close look. The the matte black finish, premium cork, and black USA-made reel seat are understated, utilitarian. But the large white logo section is distinctive. I’ve heard some snickers about it, even comments that compared it to golf club decoration, which is probably the worst insult a person could level at a fly rod. But what we’d just spent the day doing is about as far from golf as life gets. Complaints, no doubt, from folks who’ve not yet cast one. And the H3D is no club. I think the white accent looks more like whiteboard. Bring a dry-erase marker and tally up your fish, or write your name on it so it doesn’t get mixed up with the other H3Ds on the boat. And when folks start test-driving these, there are going to be a lot of H3Ds in boats this season.